Want to enjoy vaping everywhere? The BLCK Flavour Vape Bag is a nifty carry bag for your favorite E-Liquid & Vape devices to use on the go, compatible with most dual/single battery operated devices and any 60ml or 30ml E-LiquidS. The BLCK mini Vape Bag, meets all your needs. 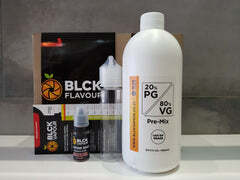 Blck Flavour is a direct importer of concentrates and bases directly from manufacturers. All products are filled by 3rd party fillers under supervision in an ISO certified lab so you can be assured you are getting a quality product without any additions. Please contact us for wholesale inquiries on bigger sizes or if you require a lead time on an item which is out of stock.